The Barclays Premier League celebrates the completion of 20 seasons in just a few weeks time, and in that time, there’s been some great strike partnerships. But who has been the best? Which duo have been most even? Which Partnership delivered for longest? And which nationalities have been been the best? Shearer and Sutton – the best Partnership in Premier League history? Firstly, this is Premier League Only. Secondly, each partnership needs to have scored at least 30 league goals be listed and most importantly, each player must have scored at least 10 goals. That means Southampton’s Matt Le Tissier and Neil Maddison do not qualify as the 32 goals were split 25/7. Nice try Neil. If there are mulitple combinations, the highest one will be used. For example, in 1999, Yorke and Cole (35) and Yorke and Solksjaer (30) both reached the required number. I’ve decided that the Partnership doesn’t necessarily have to be two strikers. 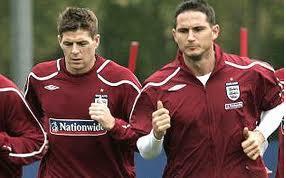 It can also be made up of Forward and Winger, or Forward and Attacking Midfielder – such as Torres and Gerrard. 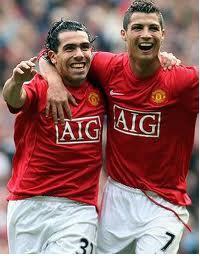 8 – pairs managed to score 40+ and only 2 of those partnerships have topped 50 goals. 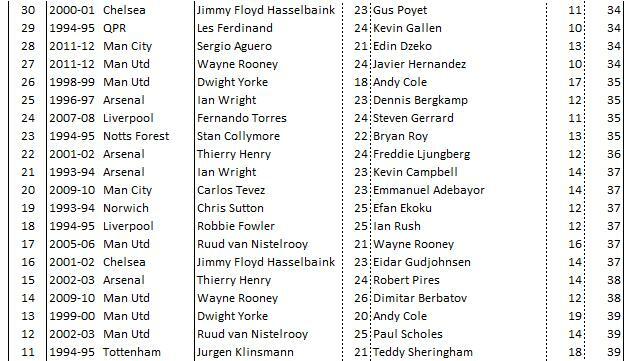 Who’d have thought that van Nistelrooy and Solksjaer (40 goals) were more prolific than Cole and Yorke (35 and 39). Similarly, Sheringham (who’s been left out of the 20 year awards for some unknown reason) and Chris Armstrong at Spurs were more prolific than Berbatov and Keane. The eagle eyed among you will notice Henry and Pires teamed up on no less than three occasions to break the 30 goal partnership mark – 2002-03, 2003-04, and 2004-05 – with Pires hitting 14 league goals for three impressive consecutive seasons from midfield. Just don’t ask them to team up on penalties. Aguero and Dzeko in 27th place can still add to their tally, as can Rooney & Hernandez – both partnerships are on 34 goals for this season. Most surprising of the partnerships? I’d say Chris Sutton & Efan Ekoku (37 goals) and and Mark Bright & Gordon Watson (31 goals) – though both pairs did it in a 42 game season. Some surprising ommisions include Anelka & Bergkamp, who hit 29 league goals in 1998-99, Leeds pair Viduka & Smith (28 goals in 200-01) and Dwight Yorke & Savo Milosevic who also hit 29 goals in 1995-96. In one way it one of the most unlikely prolific partnerships (and it was a proper partnership) going. Just a few years earlier, Phillips was struggling in a Watford team plying their trade in Division Two (League One) and Niall Quinn was something of fading star – returning to the Top Division aged 33 after helping Sunderland to promotion. Despite having had a 41 goal partnership in the promotion campaign (23/18), many predicted Sunderland and Phillips in particular to struggle. Rodney Marsh was quoted as saying Phillips would “struggle to score 6 goals”. But then he may not be the best judge given some of his other statements. Instead, they formed one of the best partnerships the league has ever seen - and comfortably the best from a promoted team. Phillips had his greatest ever season with 30 league goals and Quinn managed a decent 14 – his second highest top flight tally in his 19 year career. A great return for a target man. The classic Big Man-Little Man partnership would stay together for another two full seasons, although they never recreated that magical season with 21 in 2000-01 and 17 the following year. 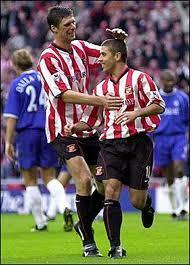 Quinn retired after only 8 appearances in 2002-03 whilst Phillips moved on to Southampton in the summer of the same season, scoring just 6 goals – with Sunderland relegated. Best Moment: Sunderland 4-1 Chelsea. Both scored a brace as they beat much fancied Chelsea to move into 4th place, and avenge a 4-0 opening day defeat. http://www.youtube.com/watch?v=LFspQb8u9DE . Though Sunderland fans will tell you it was when both scored to beat Newcastle at St. James’s park. Going one better than the Wearside duo were the slightly more glamorous pairing of Ronaldo and Tevez, though as with the goals, the glamour was more from Ronaldo than the Argentinian. Part of a front three with Rooney rather than an out an out partnership (Rooney got 12 goals), their goals fired Man United to a League and Champions League double. This was the season that Ronaldo went from very good to one of the best in the World as he hit an incredible 31 goals in 34 league games. Tevez enjoyed his first season at the club after an eventful stay at West Ham, and hit a decent 14 league goals – doubling his tally with the East Londoners. These days, Ronaldo would be embarrassed to score only 31 league goals at Real Madrid (he scored 40 last season and has 41 this season) whilst Tevez outscored every Premier League player over the 2009-11 period with 43 goals in the Sky Blue of Man City. The pair, along with Rooney, were together for the 2008-09 season as well, but Tevez was left frustrated as Dimitar Berbatov’s signing restricted his playing time – leading to the controversial move across Manchester. When Chris Sutton was signed from Norwich (where he had a surprisingly good partnership with Efan Ekoku), eyebrows were raised in the football world. £5 million now would buy you a seventh of Andy Carroll, but at the time it was a big deal as it smashed the English Transfer Record (Kenny has form in this area). 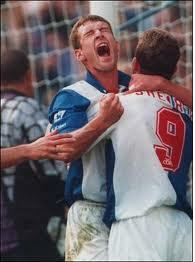 In the 1993-94 season, Blackburn finished 2nd to Manchester United with a decent 84 points but a stingy 63 goals. Shearer scored 31 of them, whilst the next highest scorer was Kevin Gallacher with 7. Support was needed, and Chris Sutton with 25 goals the previous year, was the outstanding candidate. In a slightly unusual big man-big man partnership, the pair linked up superbly. Fuelled by the crosses of Jason Wilcox and Stuart Ripley, the pair smashed in 49 goals between them. Once again, Shearer was the main man, but Sutton chipped in with decent 15 goals to push over the line – beating Man Utd to the title by one point. 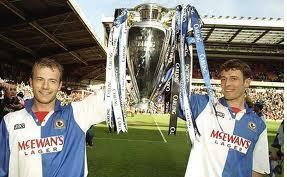 Unfortunately for Blackburn fans, the two of them never really clicked again. Sutton suffered an injury plagued season as they attempted to defend their title, playing only 13 games with no goals. It didn’t affect Shearer too much as he still scored 31 league goals, but the team suffered with Sutton’s absence. That summer, Shearer of course made the £15 million move to Newcastle where he’d strike up a good partnership with Les Ferdinand (see number 7), whilst Sutton in turn worked will with Gallacher (number 32), but neither managed to find a better partnership. Best Moment: Lifting the Premier League Trophy on the final day of the season. They linked up on numerous occasions throughout the season, with this 3-1 win over Villa a typical example (apologies for the advert first) http://www.dailymotion.com/video/xejzac_shearer-x2-sutton-vs-aston-villa-se_sport. For Chris Sutton, it was the hug that Alan Shearer gave him in the photo above. He loved that. Not your typical partnership with a central midfielder and centre forward, but between them, Didier Drogba and Frank Lampard scored a whopping 51 goals – becoming only the second duo to break the 50 goal mark (see below), and the first to do so in a 38 game season. And in a way, they were Chelsea’s main attackers. In a 4-5-1 formation (or 4-3-3 depending on your viewpoint), Drogba led the line on his own, with Lampard breaking from deep to get into the box at every opportunity. Drogba’s late charge saw him overcome Rooney in the race for the Golden boot, whilst Lampard also had his best scoring season – and is the highest scoring second player in the partnerships list. The pair also combined to break the 30 goal mark in the 2006-07 (Drogba 20, Lampard 11), whilst Lampard is also on the list with Nicolas Anelka in 2008-09. And that takes us to first place in the list of prolific Premier League Partnerships. Did you guess who it was? And so it’s a partnership from just the second season of the Premier League that takes top spot in the list. It was by no means a guarantee either. Newcastle had been promoted the previous season, and Andy Cole had onnly played 12 games for the club, and had never played in the Premier League. Beardsley had been re-signed to his hometown team aged 32 after spells with Liverpool and Everton, aged 32, he was brought in to add a bit of experience. No one could have expected what happened next. 55 goals from a combined 75 games saw the Toon Army finish a lofty 3rd in the league as Kevin Keegan’s men gained the title of ‘The Entertainers’. Cole and and Beardsley were central to this, and their partnership reminded many of Beardsley and Lineker for England – the classic tricky creative number 10, feeding the classic speedy number 9. Although it was a 42 game season, they still finish first when re-calculating for a 38 game league. They were by far and away the best partnership the Premier League has seen – which is especially surprising given that they’d never played together before. Sadly for Newcastle fans, it would be the only full season that they played together, as Cole made the controversial £5 million move to Manchester United midway through the 1994-95 season. He’d go on to great things at Man Utd, but even though his partnership with Dwight Yorke is considered one of the best, it was nowhere near as good as his pair up with Beardsley. Manchester United’s Wayne Rooney is the man to go to if you want a successful partnership. He’s been in no fewer than seven 30 goal partnerships over the years for United (only five above as Tevez and Hernandez edged him out of other partnerships). Twice with Cristiano Ronaldo, once with Dimitar Berbatov and Ruud van Nistelrooy, and this season with Javier Hernandez. On four of those occasions, Man Utd have gone on to win the league title. Interestingly, Rooney has only been the principal scorer in two of these partnerships – this season and 2009-10. Aged only 26, he should go on to dominate the Premier League Partnerships in the coming years with both Danny Welbeck and Javier Hernandez. Just behind Rooney are three more Englishman – step forward Les Ferdinand. Sir Les was part of a 30 goal partnership on three occasions, and each time was with a different partner. First up was Bradley Allen at QPR in 1992-93 (20/10). He followed that up with a 34 goal partnership with a young Kevin Gallen two years later (24/10) before making the big money move to Newcastle that summer. Although he hit 25 league goals in his first season, Beardsley only hit 8, meaning they don’t qualify. Instead it was the partnership with another Geordie, Alan Shearer, that saw a 41 goal partnership in 1996/97 (25/16 – Shearer). Ferdinand left the Toon Army after just two seasons, and could never find another suitable partner. And matching Ferdinand on three partners is yet another Englishman – Robbie Fowler. Despite leaving Liverpool for the first time aged just 26, he was in four 30 goal partnerships at Anfield, with Ian Rush (37 goals) in 1994/95, Stan Collymore (42 goals and 30 goals 1995-97) and Michael Owen (32 goals) in 1998-99. Chris Sutton also managed the achievement, albeit hard to believe for any Chelsea fans that saw him play. Firstly in 1993/94 with Efan Ekoku at Norwich City (37 goals), followed by the famous S.A.S. partnership with Shearer the following year (as mentioned above), and lastly with Scotland’s Kevin Gallacher in 1997/98 (34 goals). Aside from the English, Dimitar Berbatov has also managed to be part of three 30 goal partnerships. Unsurprisingly it’s the England and England Partnership that occurs most often in the 20 years of Premier League football, when looking at 30 goal partnerships. Although that’s certainly a changing trend in recent seasons. The last time an all English partnership scored 30 league goals was over 10 years ago – when Michael Owen and Emile Heskey (stop laughing), scored 30 goals exactly (16/14) for Liverpool in the 2000-01 season. Aside from the All England partnerships, it’s the French that are the next best. The three all French partnerships were all Henry and Pires for the three seasons from 2002-2005. Eric Cantona (with Giggs), Henry (with Ljungberg), and Anelka (with Lampard). After the French, it’s the Dutch – van Nistelrooy, Hasselbaink, Bergkamp and Bryan Roy. Robert Pires and Frank Lampard appear on three occasions each, with Steven Gerrard (twice with Torres) and Freddie Ljungberg also making it. Lampard was by far and away the most prolific with 22 goals in 2009-10, with Gerrard hitting 16, Pires hitting 14 (3 times) and Ljungberg scoring 12 as part of a 36 goal partnership with Thierry Henry in 2001-02. 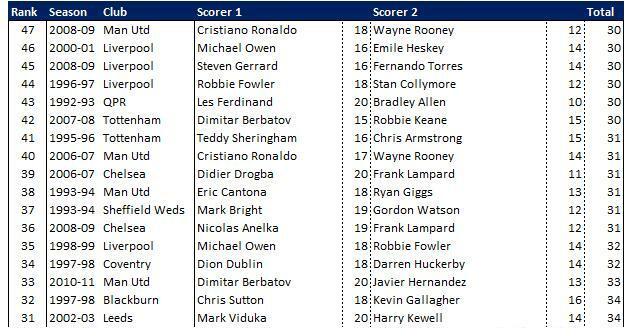 I’m counting Cristiano Ronaldo as a Forward in this list. Poyet, Giggs and Scholes make up the rest. And that’s about that on 20 years of the Premier League Partnerships. The Worst Duo? Well I saw 32 year old Mike Newell team up with a 32 year old Iain Dowie who was in the middle of a year long goal drought. The seven games together saw zero goals – although it was useful in spurring on Harry Redknapp to sign John Hartson and Paul Kitson - a partnership that kept West Ham up in the 1996-97 season with 13 goals combined from the last 11 games of the season. Unfortunately for Hammers fans, Kitson’s West Ham career was blighted by injuries, meaning the partnership never really got a chance to blossom. Has anyone done a similar comparison of La Liga and Serie A strike partnerships over this period? Cheers Daniel. With regards to La Liga and Serie A I’ll look into that in the future. The reason it was a little easier to do for the Premier League was that I only went back the 20 years that the Premier League has been formed for. Serie A goes back a lot longer (I’d have to check on La Liga/Primera Liga), and the data isn’t as easily available for anything earlier than 1993. It’s definitely something i’d like to visit in the future though, maybe limiting it to the 20 year time limit. Certainly Romario and Stoichkov would have to be included, and Serie A has seen some great partnerships – Vialli and Mancini for example.